The following two entries dive deep into the recent report I co-authored on connecting Charlottesville to Monticello & beyond. A large part of our research centered around the fabulously-successful Saunders Monticello Trail, which serves as a gateway to Monticello and will the linchpin of our connector(s). 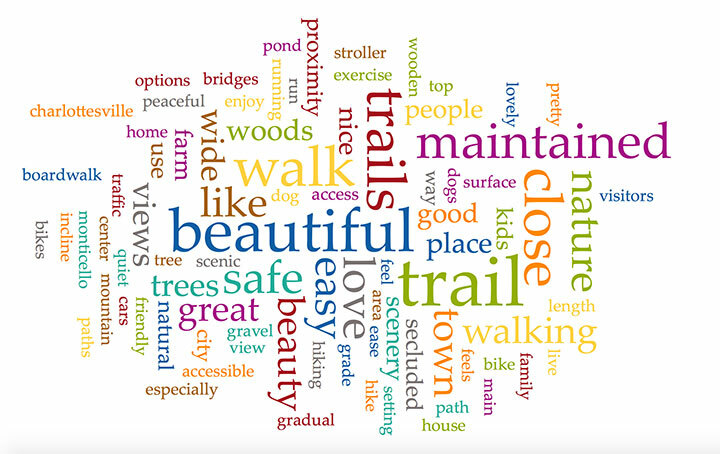 We conducted a survey of current trail users because it is essential that we understand their preferences and desires if our own project is to be successful. The survey succeeded far beyond our expectations, with 1010 responses in 18 days. The chart tallies a manual count of concept mentions relative to connectivity. We also did a word cloud cloud (see end of article) but we found the manual method much more informative and precise. A word cloud, for example, does not distinguish between a user who says "I want a connection," and one who says, "I don't want a connection." Word clouds give a useful glimpse but are not sound basis for policy. Out of the 1,010 survey responses, there were 443 comments in response to the open-ended question “Do you have any other comments about connecting the trail to Charlottesville and/or other destinations (e.g. Morven Farm, Highland, Mill Creek, PVCC)?” The chart left illustrates the relative themes that emerged. All topics with two or greater mentions are included. Among the responses, the most mentioned by far was a positive response expressing support and excitement for the trail. Respondents mentioned Piedmont Virginia Community College more than any other destination, but quickly followed by many of the major destinations explored in the study: Morven Farm, the Rivanna Trail, James Monroe’s Highland, Route 20, Belmont and the Charlottesville downtown area, and Avon extended and its associated neighborhoods (including Mill Creek). Several other respondents considered the broader regional connection possibilities, including the 3 Notch’d Trail, Scottsville, and Crozet. A significant number of respondents mentioned desire for bike access through the connection. Some respondents hoped for facilities if the trail is expanded and connected into a wider network, particularly parking. 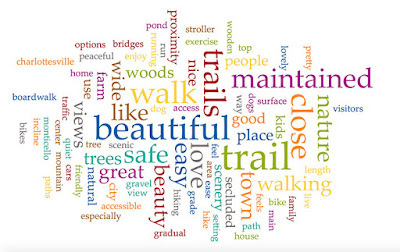 Regarding accessibility, several respondents mentioned a desire to continue bringing their family to the trail, others mentioned a desire to bring dogs, to connect the trail to transit, and for the trail to be ADA accessible and friendly for senior users. Of particular note about the transit access, several respondents mentioned a desire for a shuttle bus that would connect the end of the trail to key destinations within Charlottesville, including PVCC, UVA, and the Downtown Mall. Several respondents mentioned a desire to highlight and maximize historic and cultural connections through the trail network expansion. Some respondents mentioned key physical aspects of the trail, including a preference for a pathway that is not directly adjacent to the street, and a desire to increase crosswalk safety. 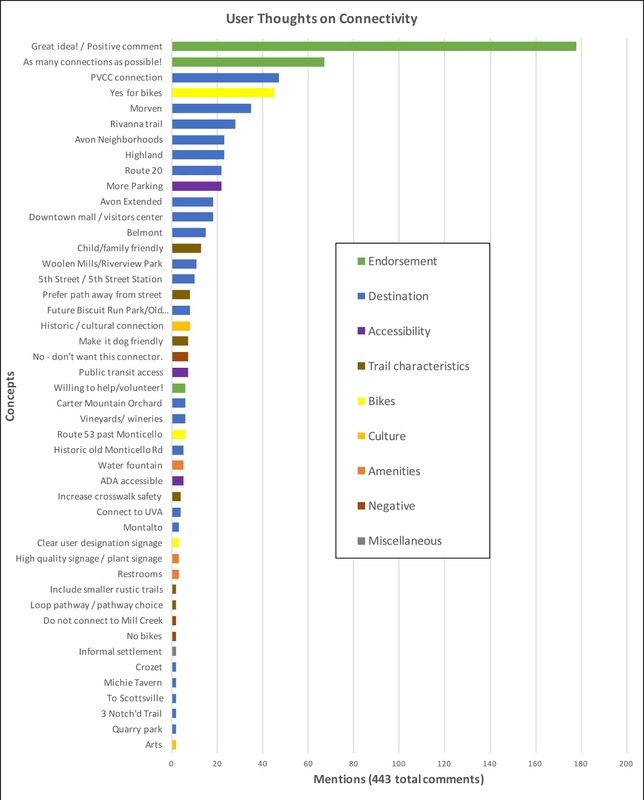 A few respondents reacted negatively to the premise of the study: either they did not desire a trail, did not desire a trail to connect to their neighborhood, or did not desire bikes to be allowed to use the trail. Two respondents expressed concern and recommended thoughtful consideration about the people who have set up camps beneath and near the I-64 and Route 20 bridges.